Raining and 35°-why shouldn't I cover my crawl space vents in the winter? 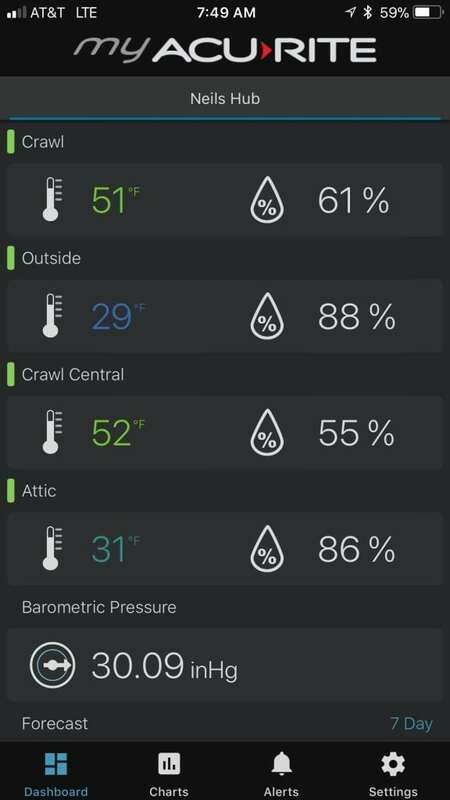 - Charles Buell Inspections Inc.
You are here: Home / Type / Energy Efficiency / Raining and 35°—-why shouldn’t I cover my crawl space vents in the winter? Raining and 35°—-why shouldn’t I cover my crawl space vents in the winter? It is OK to leave them open—that is how it works in the Northwest. I know that it may seem counter-intuitive, but you can actually lower the humidity in your crawl space by bringing in that wet air in the winter. I will attempt to keep it as simple as possible by speaking in “generalities” as opposed to specific temperatures and humidity levels. Lets take air that is very cold and saturated (as in raining), and bring that air into the crawl space that is warmer than outdoors. When that cold wet air is heated to the temperature of the crawl space, not only can it easily hold the moisture in that air (and not rain in your crawl space) but it will mix with the warm humid air of the crawl space resulting in a net lower humidity of all the air in the crawl space. As that air then moves out of the crawl space the humidity of the crawl space will thus be lowered. Temperatures in the winter in the NW are generally favorable for this to happen and reverse slightly in the summer. In this sense, general humidity and moisture levels can be expected to rise in the summer and then drop back down in the winter. Of course without proper venting the moisture levels can build to far above acceptable levels, resulting in wood decay/rot and infestations of Anobiid Beetles etc. And that, in a nut shell, is why it is a bad idea to cover those vents in the winter. This same principle can happen in the indoor environment if we bring too much of that wet cold air into our very warm indoor environment and result in humidity levels inside the home becoming lower than desired. 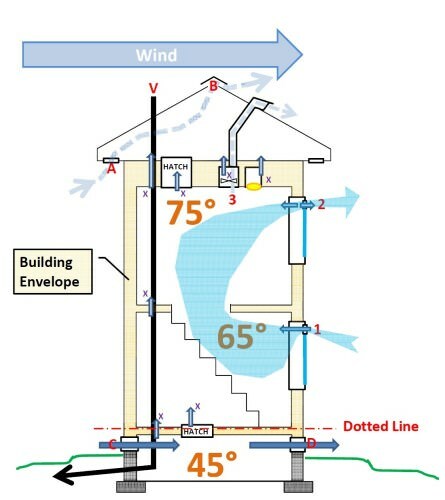 This can be especially pronounced in two or three story homes where stack effect, induced by pressure/temperature differentials as well as by winds blowing by the house, come into play. A simple way to think about this is that the house is having the air sucked out of it at the top and sucked in at the bottom (your house is acting a bit like a chimney). 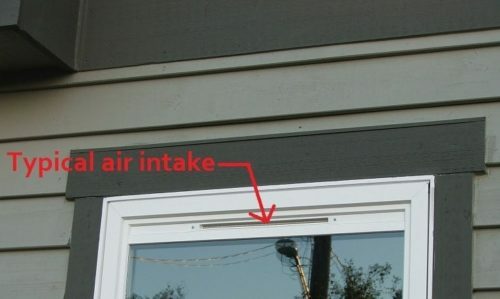 This can be especially problematic with houses that have window inlets as part of whole house air ventilation systems. 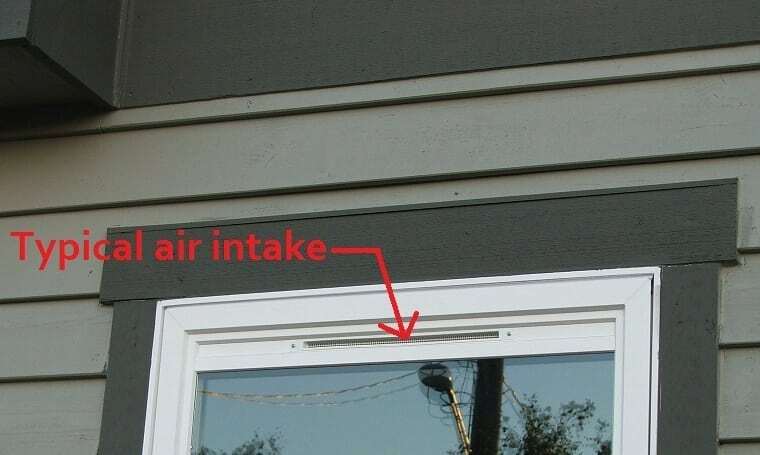 These air intakes at the windows are one of the ways to meet modern energy code requirements to bring fresh air into the home. The problem with them is that in multi-story houses, they do not just bring fresh air into the home whenever an exhaust fan is running, they also continually vent outward at the top and inward at the bottom (due to stack effect) when fans are not running (see drawing that shows window vents at “1” and “2”). This creates WAY more air changes in the home than necessary, wasting considerable energy, and it can lower the humidity in the home by the same principles that reduce humidity in the crawl space. There are other factors that can contribute to loss of control of house humidity due to stack effect. Openings anywhere in the building envelope can result in air moving in and out of the building where we don’t want it to. 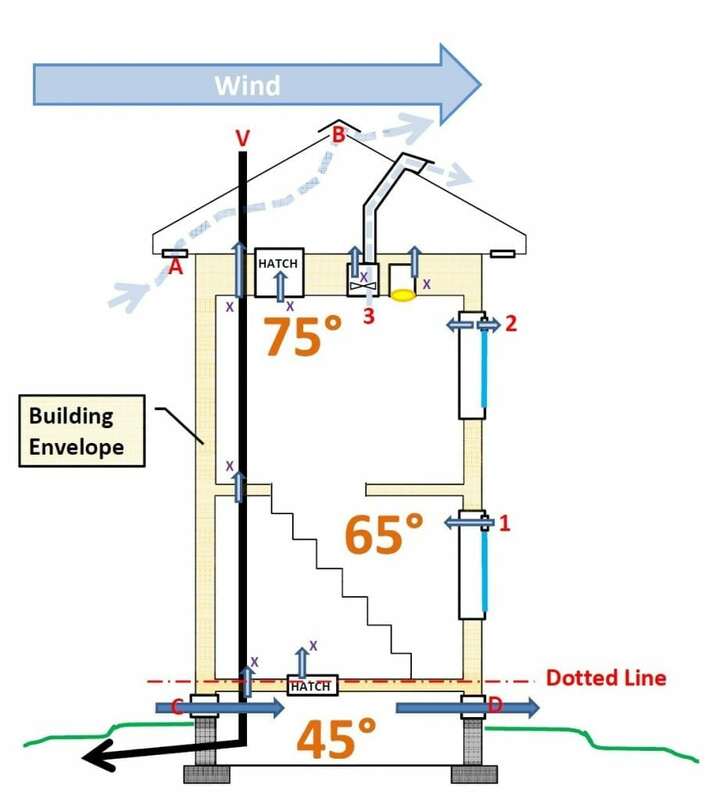 This is why it is so important to keep the “Dotted Line” (see drawing) as perfectly sealed as possible so that we are not pulling crawl space air into the home. In many homes a very large percentage of air that is being drawn into the home can come from the crawl space. In the drawing we can see that penetrations like plumbing pipes (marked “V”) are sources of such leaks—but “V” should also be seen as symbolizing b-vents, chimneys, wiring holes etc. Inadequately sealed attic hatches and crawl space hatches can represent very large breaches in the building envelope. Obviously exhaust fans can represent breaches—but they are designed to be breaches. Unfortunately, even when the fans are not running they can still have inadequate dampers and leak around the fan housings themselves. Of course running them 24/7 would result in pulling all that cold/wet air into the home around the clock. Can-lights or any electrical junction boxes in the building envelope—especially at the attic level—can represent significant breaches of the building envelope as well. While right now we are primarily discussing the effect of bringing cold/wet air indoors, we can obviously create problems for the home if this heated/moist air can find its way, or is vented directly into the cold attic space. 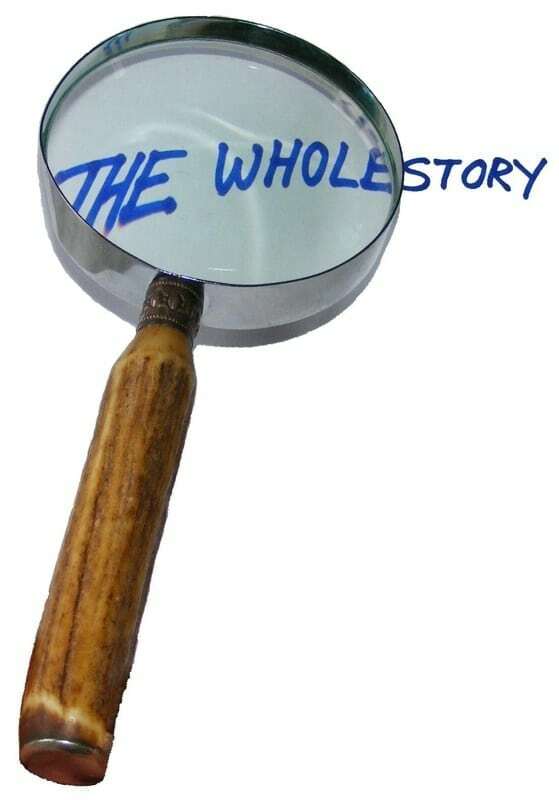 A real-life story of how this works happened on a recent inspection. My client complained that he was not able to keep the humidity in the home high enough in the winter to protect some very expensive guitars. I suggested that he correct the missing weather-stripping on the attic access hatch and close the upper window air intakes. Humidity levels quickly returned to normal levels and the guitars are now happy. 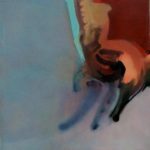 I have seen a picture on google posted from your website. It shows a washer tray that is a combo floor/wall. I cannot find these in this area and was hoping that you could give me a manufacturer name. I agree with your article except for referring to cold wet air. Cold air is dry, hince the lower himidity levels. 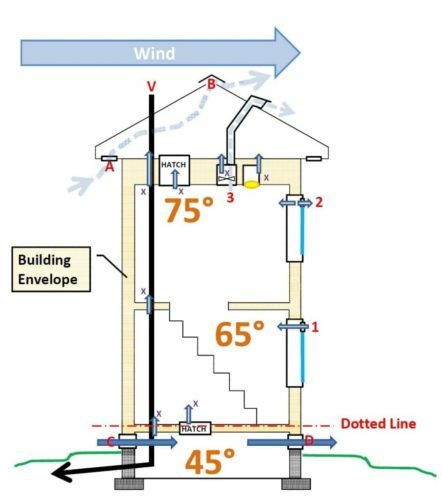 I have written several articles on foundation venting and the need to open crawl vents in the winter and close them in summer. I have also written articles on conditoned vents, but the science on these is changing. You can find my articles on the Scripps Howard News Services or by doing a web search for C. Dwight Barnett. Kerp up the flow of relevent information. Charles, thanks for the great article, just what I needed and we’re not going with vented windows now. We’re going to put in a ductless mini-split system in a house we just bought and doing a full remodel down to the studs (one-story 1264sf 2br/2br) and have been worried about fresh air intake – read an article about Broan air intake systems or similar being the best for fresh air circulation with ductless – it’s our retirement home here in the PNW and we want to keep the right humidity, (previous homes air was too dry in winter) good warmth and fresh air combination – what are your thoughts? As long as you “control” the rate of flow of the air intake—or minimize it at a very low continuous rate, you should not have a problem. HRV’s and ERV’s are also a great approach. I bought a house in Seattle, a simple rambler 1000 sqft, yet I have a ground water issue in the crawl space when it rains. Luckily there is a sump pump, working to solve the issue but for now I have high humidity levels in the crawl space when water is present. Would it make sense to seal the air vents and use a dehumidifier instead? It would be very rare that I would recommend closing crawl space vents in the NW–normally it would only make things worse. Do you have a very complete vapor barrier covering all of the crawl space? Do you have enough vents? How do you know what the humidity levels are? You might need to have a qualified party make an assessment for you. I have a complete vapor barrier and use an outdoor temperature and humidity monitor and just place the outdoor unit in the crawl space. There might not be enough vents as you mentioned so I am looking in to that. Thanks for the article. In the Pacific NW cool humid air seems common, today it is raining with RH in the 80’s. My crawl follows the humidity into the 80’s , outside and inside crawl are 63F . How can a well ventilated crawl be any lower humidity than outside when temperatures are similar( no ducting in my crawl ) and is this unacceptable RH? . Depending on weather crawl normally roams between 65 and 75 RH, temperature is generally below the dew point with no apparent signs of moisture down there. My reason for concern is the often cited 70% RH for mold. Is that red line just for the south or NW as well? And that is why it is this time of year when wood moisture content in crawl spaces rises. With proper venting in the winter they will go back down to more acceptable levels. “Theoretically” you might be able to close vents in the summer but there is the danger moisture levels would raise even higher than the ambient humidity—so keeping them open year round is the best plan. Thought I would add a post, I hung humidity detectors in my crawlspace and the science bears out exactly as posted here , I will include an image from the sensors. 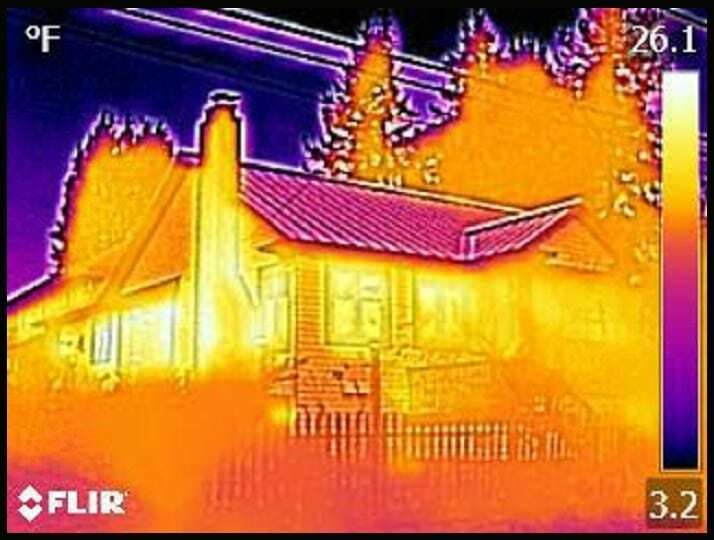 Next question is the attic, when well insulated it’s temperature is very close to the outside temperature and humidity is close as well, with 90% outdoor humidity common in PAC NW is that a problem for the attic, it’s readings are on the same image. Any comments on the attic are appreciated as humidity is high but it is outside as well.